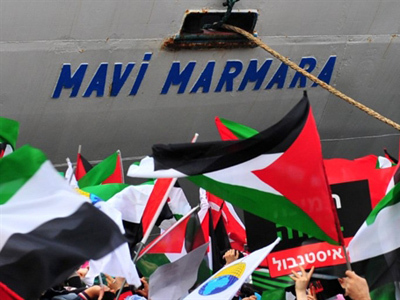 The world’s mass media are alarmed: activists of the Free Gaza flotilla are receiving resistance training to repel Israeli army attacks. The press reports it is banned from the training site, which definitely means something insidious is underway. 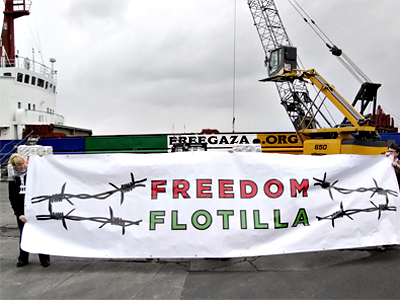 Members of the Free Gaza and Save Gaza Movements have repeatedly invited independent organizations willing to check the vessels and the passengers to come and make sure there are no hazardous cargoes or weapons aboard. I have already attended three trainings for passengers and what I heard there were instructions how to survive with minimum loss and humiliation. 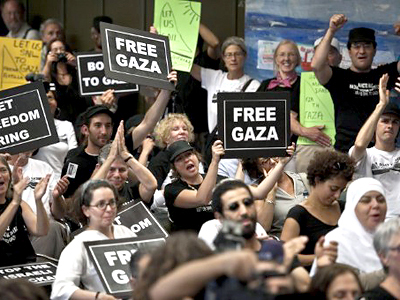 No one calls on the participants to rebuff the attacks of the Israeli army, moreover, everyone is unarmed and there are a lot of women and elderly people among them. The trainers instruct them how to get through the military action of the Israeli army and stay safe and alive, how to help the weakest participants, what to do in order not to get disoriented after having to drift in the sea for a long time or in case of an unexpected attack. Alice Walker emphasized that all the participants of the flotilla training are aware of the high degree of risk they are exposed to. 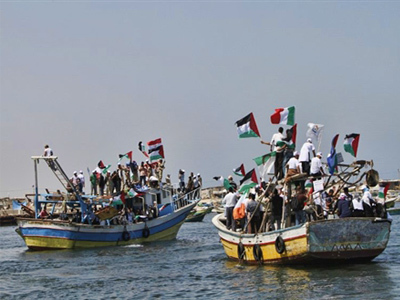 But she also said the training is a risk for the participants of the peace flotilla, not for Israel’s security, as that country’s officials state. Those who have already faced aggression by the Israeli army against defenseless activists share their experience at the trainings with those who have not. They describe the threats flotilla passengers may face, teach other participants to tell paintball shooting from bullet shooting by the sound, to take action if you happen to be the target of a telescopic sniper rifle sight or if they try to wash you off the deck with a fire hose, and what to do in case of a gas attack. 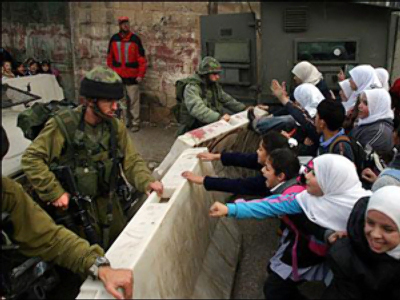 They tell the newcomers what the Israeli soldiers could be expected to beat them with, what is the right course of action when they set dogs loose on you and the beasts start biting into your flesh, or what to do when someone gets swept into the sea. It is important to understand why it is so dangerous to jump into the water and so on. We watched a few videos of the Israeli army attacks against flotilla ships and fishing boats from Gaza and the trainers commented on them. They stressed that you should only take the things on board you cannot do without – luggage should be minimal. We are told what medications help best against seasickness. There are no doctors on the teams, but each group has a nurse and you had better know them by sight. 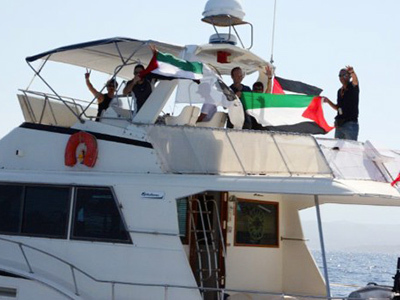 Many of the journalists who have access to the flotilla trainings keep records of what is going on there. They testify there are no self-defense lessons on board, martial arts are not taught there either. 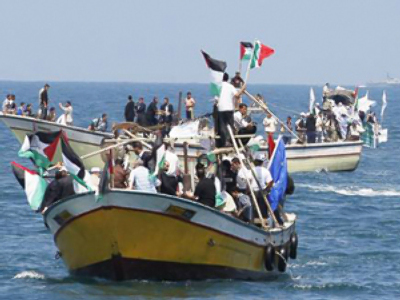 Moreover, the trainings pursue the goal of helping the flotilla passengers to suppress the natural desire to respond to an unmotivated invasion of a foreign army which makes you think of a vessel seizure by pirates. A lot is said about how to suppress this response reaction.And the main argument in favor of this is that your actions will only infuriate the soldiers, who will vent their anger on the weak and defenseless passengers.